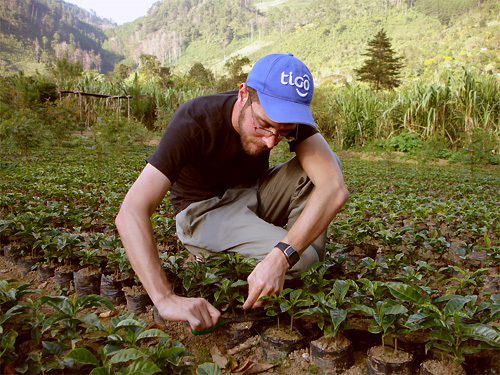 Guatemala is one of the top ten coffee-producing countries of the world and half of the nationally grown coffee is exported to the United States. Did you think of me this morning when you had your coffee? Because I thought of you when I planted it. May began the corn season with controlled burns. By the middle of july, the charred plots were bristling with green stalks high enough to hide a Pedro. The corn is ready in September, but harvest is delayed for a month while the stalks dry where they stand. 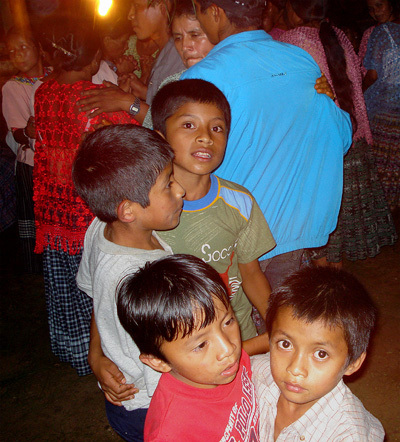 On October second, I surprised the men of Sanimtacá when I went with them to q’olok (harvest corn). 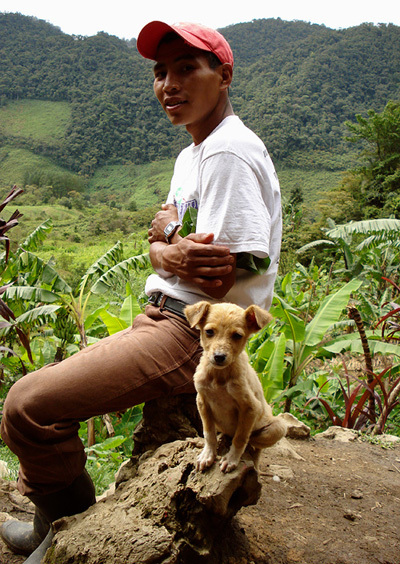 The tracts of cropland are steep in Sanimtacá and this late in the rainy season, muddy and slick. While the men trooped downhill from the road to the corn, I lagged behind, warily negotiating the muddy grade. The procedure for harvesting the corn is fairly simple. The ear is pulled from the stalk and the stalk is bent to the ground (to mark it spent). 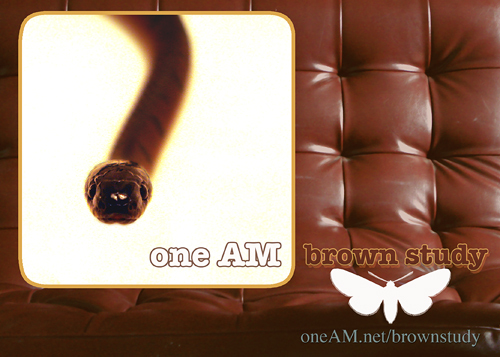 The apical remainder is snapped off the ear and the outermost leaves come with it. What’s left is a heavy elongate teardrop of a missile. At this point the corn is pitched toward a common pile somewhere in the field. From a distance, the process resembles trench warfare. Potato-mashers rain in on shared targets from obscured positions. The harvest was fun. The haul was not. Each man loaded up a huge sack with as many ears of corn as it could hold. It’s important to make use of the natural wedge-shape of the ear to maximize your carrying capacity. Each person then takes his 100+ pound sack of corn, straps it to his head, and hikes to the house. I chickened out and (taking the distance ahead of us into account) carried about forty pounds over my shoulder. The climb back up to the road was even trickier than the descent. Back on the road, I did manage to slip and fall, corn and all. The president of the cooperative offered his cargo for me to carry. He thought it would make a good photo. I assured him that it would kill me. In keeping with the cooperative nature of the community, all the men pitch in with their neighbors’ harvests and receive help with their own. So we all worked the same plot of land that day and we all carried the day’s harvest to one house. The houses in Sanimtacá are wooden structures with dirt floors and peaked thatch or corrugated zinc roofs. Living and cooking space occupies the bottom floor, but most buildings have a second-floor attic space for furniture and supply storage. The space above the kitchen is blackened by cooking fire and receives twelve hours of heat and smoke every day. This is where we deposit the corn. Sanimtacans are tough. Even so, as we neared our destination, heavy steps quickened and furrowed brows dripped. Each of us in turn climbed the ladder to the second floor to add our hauls to the larder. When I got to the second level, the hot smoke hit me hard. I emptied the bag and got myself outside in a hurry, coughing and tearing up. It’s possible to grow corn twice annually. 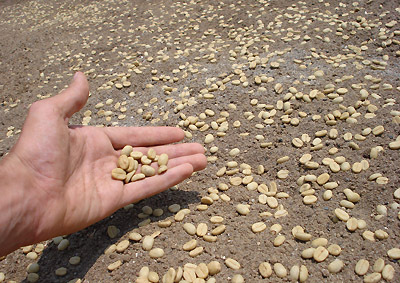 But where we live, cardamom and coffee season block the people from growing corn more than once. 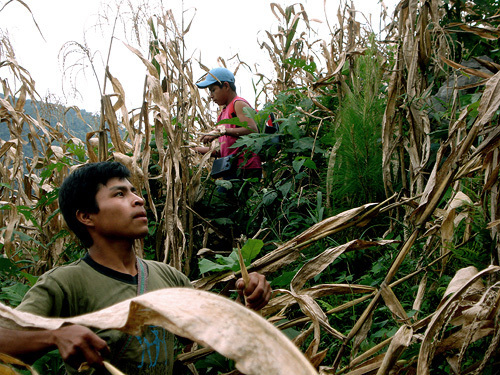 Corn is a staple crop in Guatemala, but it’s not a cash crop. It’s worth the investment for a family to grow its own corn, but it doesn’t pay to grow more than they need. So in October the people harvest all the corn they’ll need for the year. 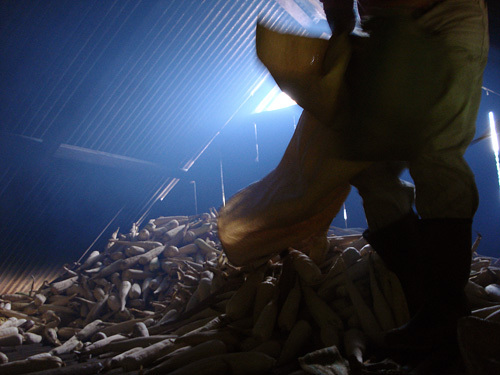 Then the small mountain of corn is stashed above the daily fires where the smoke discourages weevils, mice, and moisture from ruining the family’s reserve. Over the year, the corn is separated from the cob by hand and ground on a heavy stone with water to make a masa, or corn dough. The masa is used to make tamal and tortilla. Corn tortillas (wa) are the dependable companions to all meals. We have tortillas with our breakfast eggs. We have tortillas with our lunch beans. We have tortillas with our dinner (eggs again). And in the city, it’s not unusual to see someone at a comedor scraping their spaghetti into a tortilla. After the work, the women brought us hot fruit drinks and we waited for everyone to come in from the fields. Once everyone was back, there were a few prayers and we had chicken stew with tortillas. Everyone took turns asking if I was tired. I’m tired, but let’s do it again. And in typical reaction to my Q’eqchi’, they laughed and repeated it for anyone who might have missed it. When I arrived in Sanimtacá last week they informed me that the fiesta for San Francisco was approaching (October 11, which I knew) and that our work would be on hold so we could celebrate (in preparation. This was news). So we made our way to the house where the first party would be. Under the mild influence of a boj I sipped politely, I helped weave pacaya fronds into broad mats we hung from the rafters. While I dozed in a chair, they lit candles and covered the floor with pine needles. As the sun started to disappear, the guests began arriving. The party kicked off with prayers to San Francisco and an incense blessing. There was a candle shrine at one end of the long room with offerings for a small saint behind glass. The only other light came from a single incandescent bulb connected to a gas-powered generator. 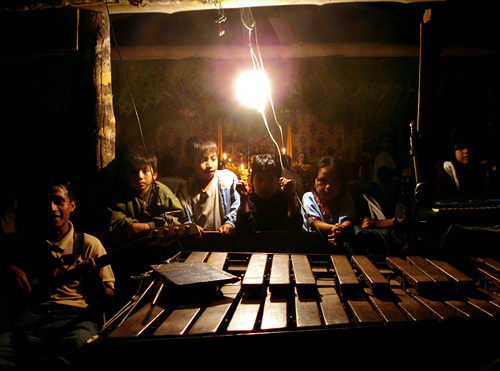 The music equipment was hooked up to the same generator and the amps belched marimba, keyboard, saxophone, and bass into the room. After the ceremonial dances, the floor was open. But Mayans can be timid, so it took some time for the swinging to start. I had already been to a dance in Samac (I even spun a few Q’eqchi’ women across the pine straw once or twice in Samac), so I was not surprised to see the women dancing with each other. But something I had dismissed as an exception in Samac turned out to be a socially-acceptable convention. As the partners rotated around the room, I saw more than a few boy couples. Some of the male pairs were young men in their late teens and twenties. By the time men were slumping on the benches, it felt late and I was ready to go. A quick check of the watch showed 10:30. Since a handful of us were leaving, I assumed the party was winding down. No, they assured me, the party wouldn’t stop until three or four in the morning. And I was high in the valley when I brushed my teeth to the sound of an invisible but thriving fiesta in the cloudy darkness. In the third grade I wrote my name on Dominic’s shoe. We’ve been friends ever since. But in the nearly twenty years we’ve known each other there has never been a stronger demonstration of best friendship than the time he came to visit me in Guatemala. I know this because for five days he wouldn’t stop saying it. September 15th is Independence Day in Guatemala (no worries if you have trouble remembering that, it’s written right on the flag). Dominic arrived just in time for the celebration. In Cobán this meant martial parades of schoolchildren with burning coffee cans on sticks, salsa dances in the square, and explosions in the sky. Back in Samac, they were throwing candy in the schoolyard. I was winged by a lollipop and swarmed by piranha children. While the piñatas were meeting their brutal fates, the cooperativistas asked us to join their soccer team. The teams were grouped by committee. 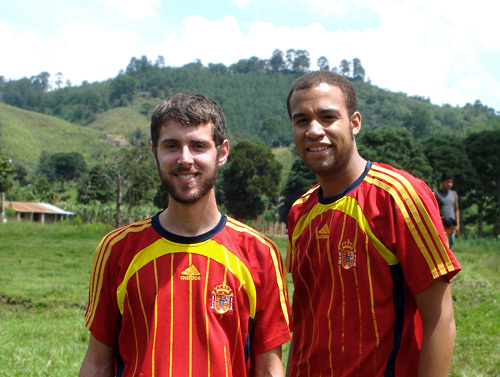 Dom and I played on the ecotourism team, but our uniforms were pure Madrid. The Q’eqchi’ don’t have a name for “Dominic,” but they decided it was close enough to “Domingo” that they could use their word for Sunday. So Qawa’ Lu’ and Qawa’ Cu’ joined the field on defense, towering over the opposition (and the support) for ninety minutes on the pitch. We went to a Mayan ceremony in Sanimtacá. Dom sat down to rest near the coffee patio while I watched the climbing ceremonial fire. The next time I looked up, he was completely surrounded by children. He had taken out his camera to shoot a quick panorama. As he panned from right to left, the kids noticed he had a camera and crowded in to look. When we watched the video later, there was a sweeping shot of the empty coffee patio with a few people in the distance. And as the camera turned back, the frame was suddenly full of curious young faces. The people offered us boj, a sugarcane moonshine, which made us both very dizzy. We had to climb most of the way out of the valley to find a place to lie down. The next morning we had to hike the rest of the way out. Dom sat down on a pile of cinderblocks at the top of the trail to rest. As he was explaining how tired he was, a Sanimtacan arrived behind us, loaded three of the cinderblocks on his back, turned around, and headed back down into the valley. A brief visit, but a good one. Also, buddy, I didn’t want to embarrass you while you were here, but “Guatemalteco!” is not how we say hello. Some of us had a project design management conference at Peace Corps headquarters last week. 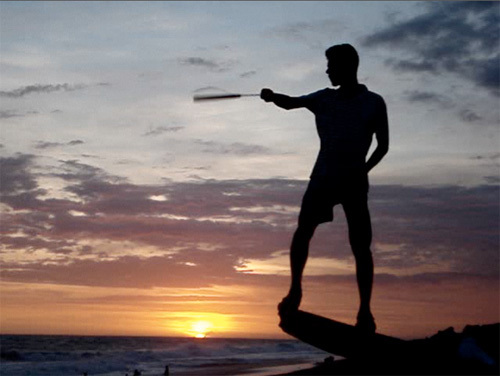 After the two-day seminar, a few of us escaped for an earned beach weekend in Monterrico on the west coast. Besides beach soccer, beach volleyball, beach baseball, and beach beach, there was swimming in the pool and fruit licuados in the shade. A nesting sea turtle kicked sand in my face. My father once told me how to watch the sun set twice on the west coast, but I had never had the chance to try it. I explained the idea to the others, but we weren’t sure if it would work. Until now I have failed to mention a recent addition to my independent studies. It isn’t easy to explain with words or pictures alone, but Tex shot a video that explains everything. Click the photo below (and do not try at home). I looked back to see the sun sinking, and we all got down on our backs in the sand to watch the sun set. As soon as the last sliver disappeared, we jumped up and climbed to an elevated point just in time to watch the sun go down again. Success all around, all injuries were minor and sports-related. Now back to work. Apologies for the lack of updates. Work picked up. 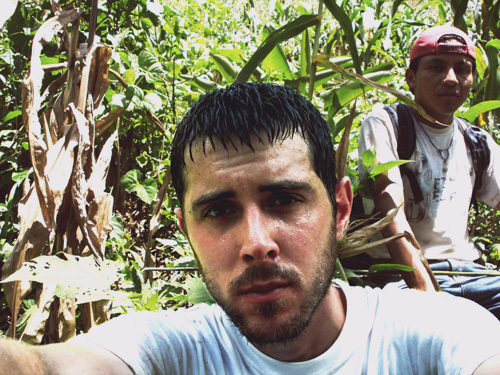 Now they’ve got me out in the campo, hiking caves, teaching classes, and scouting trails in the cloud forest. When work doesn’t extend into the weekend, I have Q’eqchi’ classes and (todavía no tengo mujer) washing to do. I plan to catch up as soon as I catch up. Antigua Guatemala was Guatemala’s second capital city (after Ciudad Vieja, before the current Guatemala City). Capital status was passed to Antigua after the devastating earthquake/mudslide in nearby Ciudad Vieja in 1541. Antigua remained the Spanish capital for 233 years, from 1543 to 1776. 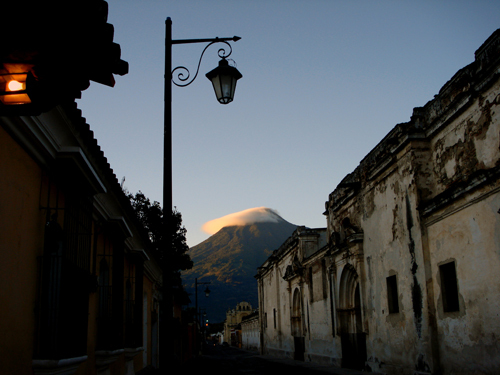 The desertion of Antigua in favor of Guatemala City was inspired by the earthquakes of 1773, which were the most destructive in an era of bad quakes. The sudden withdrawal of economic influence and resources in the late 1700′s virtually froze Antigua in time. The original colonial architecture predominates, including abandoned earthquake ruins. The city was declared a World Heritage Site in 1979 and the government has invested wisely in its protection and maintenance. The city lives under the constant watch of three volcanoes; Agua to the south (pictured), Fuego and Acatenango to the west. It’s not unusual to see a gnarly plume of smoke reaching up from Volcán Fuego in the morning or glowing red at night. Antigua is a popular destination for tourists and expatriates. When the streets and central plaza are filled with the day’s traffic, you can catch the international milieu in the mingling Spanish, French, German, English, and Mayan conversations. 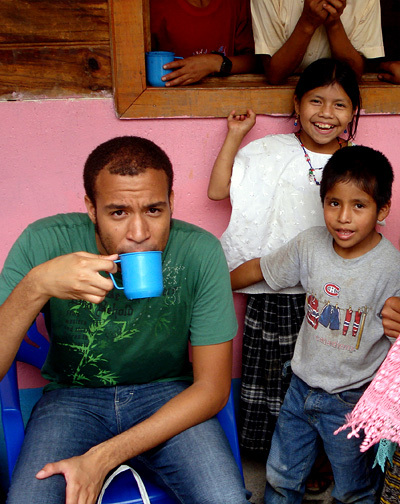 Antigua is also an important R&R destination for Peace Corps volunteers. On the third, we returned from the field for an all-volunteer conference at headquarters. Our modest but widespread community converged on the city’s affordable hostels; small rooms and small beds to rest strange but generous foreign heads. We had workshops on food security, immigration, and municipal government. This serious exercise in continuing education was not only good for work, it was sufficient justification for Independence Day’s serious exercise in conviviality. For me, this marks six months complete in-country and three months in-site. This was also my first real trip out of site since my arrival. 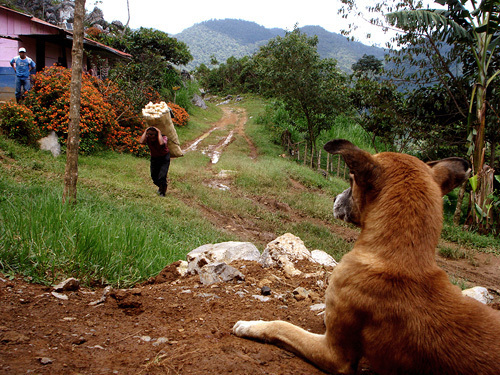 I travel back and forth between my site and Cobán weekly for food, water, and mail, but it’s a short trip. The road to the city is so bad that the shuttle never gets above 15 miles per hour. For three months this was the norm for me. So I boarded the bus to Antigua without suspecting anything was different. But as the bus left Cobán’s one-way streets behind and turned south toward Tactic, I noticed a dangerous acceleration. Suddenly the bus was hurtling down the highway at a blistering speed. I saw or imagined the faint red glow of atmospheric friction across the outside of the van as we streaked down the paved meteor trail. So I turned to Tex and asked in my most unpanicked voice if we were going a little bit fast. Clearly Mr. Yeager here did not understand the unnatural danger of fifty-mile-per-hour travel. I went to visit a friend in the city. When he stepped out to speak with someone, I started looking for the restroom. I couldn’t find it. I searched every logical place and even a few illogical ones. When he came back I asked where the bathroom was. When he told me it was indoors, I realized that it hadn’t occurred to me that the bathroom might be inside the house. We spent half the week in Antigua. We had a Fourth party for volunteers and staff in San Lucas with hamburgers and hot dogs. We had soccer balls, frisbees and potato salad. We were under the tent for the talent show when the rain started. But the rain couldn’t diminish our dance party in defiance of George III at the end. It was an event that would have impressed Washington (paternal bureaucracy and founding father alike). And the ride back seemed even faster. 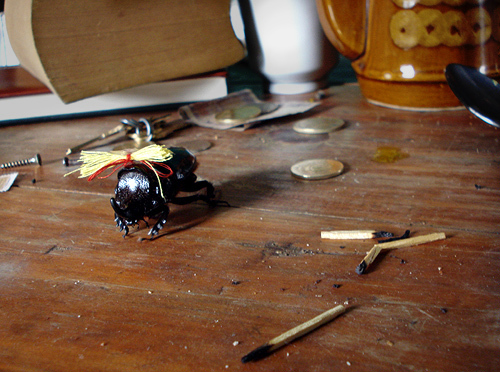 So tell all your giant beetle friends that if I find you in my house, I’m not above fitting you with tiny blonde pigtails and humiliating you on the internet. The rainy season is here -which means a lot of time under this roof. I’m evaluating (with celebration and regret) the wisdom of creating a blog to publicly document my precipitous unraveling.